I’m new at this: blogging, websites, the whole deal. I have wanted to start something for a while, but was waiting for the inspiration to hit me. Sure, good excuse. Suddenly and randomly, in the most peculiar way… it really did. Let me back up a bit. I live in Amsterdam – the city of canals, bicycles, of windmills and Heineken, and other things that do not need mentioning. Amsterdam, however, is also the city of crowded streets, old buildings and steep narrow staircases (where an elevator is a rarity). This lack of elevators fascinates me, and makes moving a bit of a challenge (trust me, I have done it twice.) Everything has to go up and down the stairwell, or out the window via a rope-pulley system. Well, on one particular evening, not too long ago, it was not so much the process of moving that blocked the street, but more so, the renovation of an old flat. This meant a giant dump truck was there – blocking my way – gutting the remnants of that third story flat – through the window. This resulted in workers bustling about; the street remaining confidently and firmly blocked for any and all passersby. “Oh great” I think. And secondly, “how inconsiderate…” And then third, “how Amsterdam”. And then a smile crept on my face. I was there on my pretty red bicycle (named Ruby) and could easily hop on the sidewalk and quickly pass the scene: no biggie. A girl headed in the other direction did the same; we nod and are on our way. It didn’t cause any trouble. Even the cars could see this in advance, back up – lights flashing – and try another street. More so, there was really no other way to renovate the said flat. 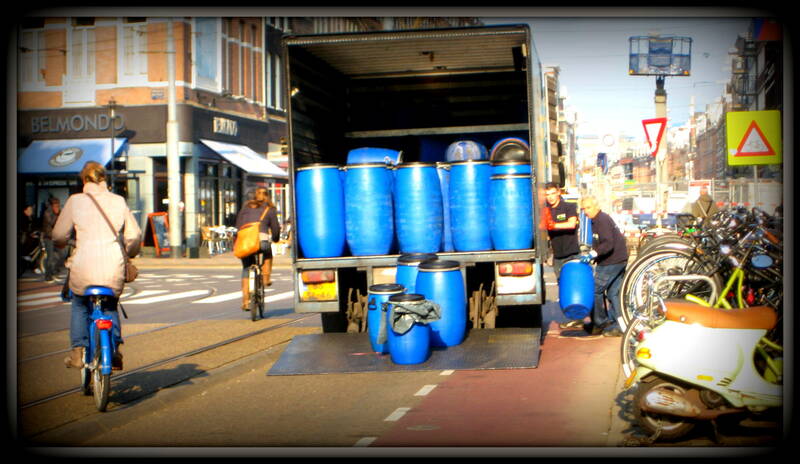 So, this is the way the Dutch do it. And not just the Dutch, countless other cities and countries around the world. But you see, here is where the ‘epiphany’ came. 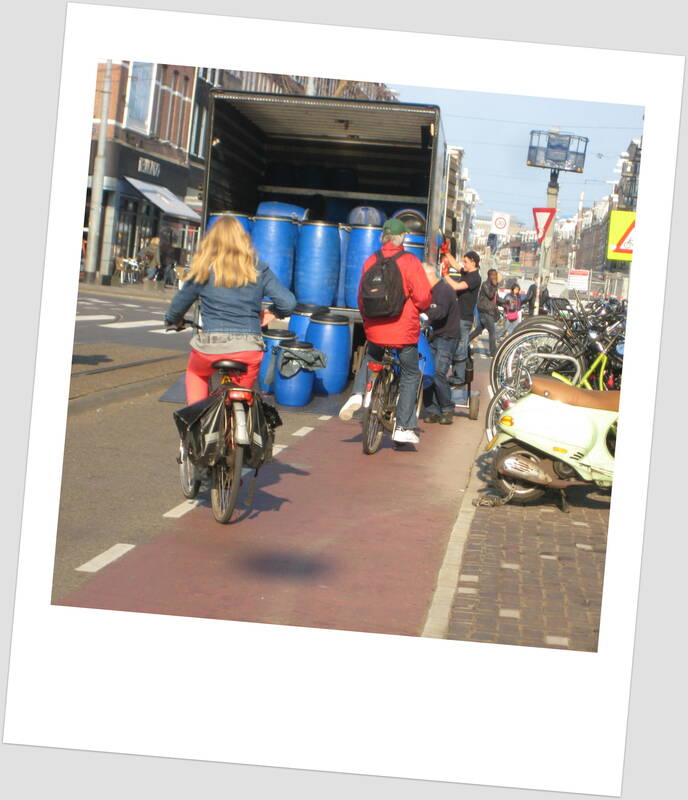 I live in Amsterdam, working as a PhD candidate, in urban environmental planning – yes I’m an urban observer for a living. But, much of my childhood was spent across Suburban USA: the land of wide streets, single-family homes, and where old refers to ‘built more than 10 years ago’. Our streets, and the vehicles that occupy them, dominate our lives. It is nearly impossible to block these streets, even if you are moving or renovating. So, in that moment, biking home from the library as it were… I decided it was time to start a blog, and I knew what the theme of this blog would be: urban observation. I love cities and I love Amsterdam – for its beauty, its history, its uniqueness… but more so, I love its iconic charm and quirks. It is the charm and quirks of this city and many cities that cause us to think, to act and react. It’s the quirks that make urban live interesting (and sometimes a challenge). Of course, structure has its place too, but in a real good city, so do the quirks and often they dominate. So, after countless travels to and within the cities and villages of the world, and living in beautiful quirky cities, I finally have my topic for expression… the everyday life and surprises of living an urban existence.